John’s recent column about self-driving cars made me ponder some of the conversations I’ve had about them recently. My favourite dream, though, is that of owning a self-driving motorhome. One evening, not too far off, I’ll use an iPhone app to summon it from its out-of-town parking space, and when it pulls up outside, Rose, Tilly and I will climb aboard with a good movie and a bottle of wine, and I’ll say, “Chamonix, please!”, before settling down for the evening. The following morning, I’ll take the dog for a walk in the Alps. Oh, and if a large vehicle will be a bit too cumbersome for exploring the winding roads of Haute-Savoie once we get there, I’ll just tell my car to follow us. Now, when it comes to these ‘autonomous vehicles’, there are plenty of naysayers around. There are those who are concerned that cars will have to make ethical decisions in the face of potential accidents, and may not always make the right ones. Conspiracy theorists talk about young or high-net-worth individuals being spared while elderly or impoverished pedestrians are sacrificed. Others fear that a car swerving to miss a dog will hit a human, and so forth. It’s not, however, clear to me that human drivers, often with less information available in that split second, will necessarily do any better, especially if they are drunk, elderly, tired, distracted or short-sighted. Many of the objections are often really variations on Phillipa Foot’s classic Trolley Problem, which has been debated for many decades without any machines being involved. It does seem clear, however, that road safety overall will be improved greatly by this technology, so unless things are sidetracked by expensive and complicated litigation in individual cases — a real danger — the lower insurance premiums associated with self-driving cars may eventually pay for their wide deployment. In fact, I expect that driving your own car will eventually be something only the rich can afford to do. 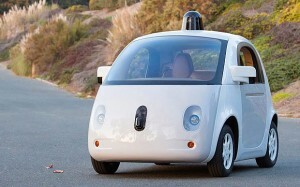 So I’m somewhat bemused when I see articles stating, for example, “The autonomous Google car may never actually happen“. Such headlines are, of course, mostly just link-bait, but it seems to me self-evident that autonomous vehicles will eventually not just ‘happen’, but will be the norm, and we’ll look back with astonishment at the time when two fallible humans were allowed to hurtle these deadly missiles in opposing directions within a few feet of each other. Self-driving cars will come eventually. The question is simply how long it will take us to get there, and how many political and legal potholes they have to dodge en route. I, for one, can’t wait: I’ll be buying an autonomous vehicle just as soon as somebody makes one I can afford. Even if it isn’t a motorhome. I completely agree. While I enjoy driving longer journeys are largely dead time on motorways or sat in traffic. I love the idea of the holiday travel but I think this has positives on work days too. On a working day the travelling time is typically done outside core hours and extends the day but means you arrive stressed and tired before you even start. You travel to the location of the office typically for a meeting, have the meeting and then have the journey home. Once home you then need to catch up on emails etc for the day as you’ve been out. If the car were to drive itself you could relax on the way in and do some of the typical daily admin. Once you’re finished for the day you could then write up the minutes, catch up on emails and be done for the day by the time you arrive home, ready for an evening with the family and ready for the next day. The benefits of a train but with no waiting and door to door.